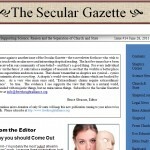 Note – The Secular Gazette has been put on hold due to lack of time which can be used for this non-profit organization. Our apologies. About the Secular Gazette: There are many other publications which have their particular viewpoint on secular issues, but few combine those issues which would seem to be of interest to the same reader. With The Secular Gazette, you will be able to read the latest news from different secular viewpoints from strong atheism to religious insertion into our political system, from skepticism to agnosticism, from the latest science news and secular articles . Sections include: Skeptics Corner – Church and State Separation News – Science News – Born Atheist – Skeptoid.com – Legal News – Politics – Right Wing Watch – Opinions – Evo Education – God is Imaginary – Funny Stuff – Local and National Groups and much more. You may download the latest issue for free, but we would appreciate you subscribing to this bi-monthly publication with painless micro-payments of only 99 cents monthly or $2.99 per quarter. That’s only 3 cents a day! Your contribution will make this world a better, more secular one.